As we enter the winter season, we are likely to experience some snowfall in the upcoming weeks. In the Chicago area and the DuPage County suburbs, the weather can change unexpectedly, so it is best to be ready to clear away snow and ice. As you prepare your garage for the winter months, you should be sure you have everything you need for snow removal, including snow shovels, salt, and snow blowers. A cheap snow shovel will not get you very far. For a good quality snow shovel, you will need to spend at least $35. To determine the ideal snow shovel for your purposes, you will need to consider the shovel’s handle, grip, and scoop. Handles: The length of your shovel’s handle should depend on how you plan to use it. A short handle allows you to easily throw snow to the side, while a long handle allows you to efficiently push snow. If you plan to do both, a medium length handle may be the best option. You will also want to consider the material of the handle, as a wooden handle is heavy, a metal handle is cold, and a plastic handle often provides a happy medium. Grips: You will want to make sure the shovel will fit your hand. A shovel with a padded grip or an extra grip lower on the handle can provide an additional advantage. Scoops: Make sure the shovel has a sturdy scoop. Metal is heavier than plastic, and steel on the leading edge can help when shoveling packed snow. However, the edge can potentially scratch surfaces, including decks and other wooden structures. Sodium chloride – This is the most common type of ice melt and is effective down to 20 degrees Fahrenheit. It is typically used as a bulky base and is very inexpensive and easily available. Calcium chloride – This is a very effective type of ice melt, as it can melt ice and snow down to -25 degrees Fahrenheit. The ice melt comes in pellets, flakes, powder, and liquid, and is typically more expensive. Potassium chloride and urea – Potassium chloride can melt ice down to 12 degrees Fahrenheit, and urea can melt ice down to 15 degrees Fahrenheit. These types of ice melt are often used around vegetation. Make sure the gas in your snow blower is stabilized. Gas left in a snow blower for a long period of time can lead to gum deposits in the tank, filter, fuel lines, and carburetor. Make sure the moving parts of the snow blower are well-lubricated. Check the cables and cable connections, and tighten all fasteners, including the nuts and bolts on the auger and chute area. After using the snow blower, make sure to clean off any salt, dirt, and other debris from the blades, tires, and frame to prevent corrosion. If there are any rusted or damaged spots on the painted surfaces, the damaged area should be sanded before a paint touch-up. 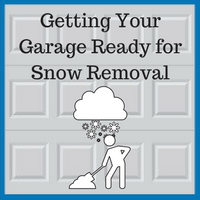 With these tips on how to prepare your garage for snowfall, you will be ready to face the upcoming winter weather. If you have any further questions on how to prepare your garage for the winter, Blue Sky Builders can help. 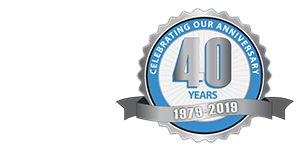 We have over 38 years of experience in the garage sector, and our garage experts can provide you with the service you need. Contact us at 630-852-8485 today. To check out our work, please check out our gallery.